Everything you think you know about your world is a lie. You may believe you live in a free society, but it’s really controlled by an elite upper class that has shaped its development from behind the scenes since its inception. You assume you have a fair shot at making a decent living or having your legitimate grievances heard through democratic redress, but the system is rigged so the elite ever has its way. No real dissent is possible, either, because the elite controls the media—rather, the media is part and parcel of the elite— and through it, all protest is marginalized, all consent is manufactured. This summarizes, more or less, Noam Chomsky’s sociopolitical analysis of America, as expressed over nearly four decades as one of the country’s most notorious iconoclasts, through copious essay, innumerable public talks, and worldwide media appearances. It also happens to summarize, more or less, Prokofy Neva’s sociopolitical analysis of Second Life, as expressed through innumerable posts on Second Life’s official Forums. Until, that is, after several months of accusation and acrimony, Linden Lab permanently suspended Neva from the Forums. 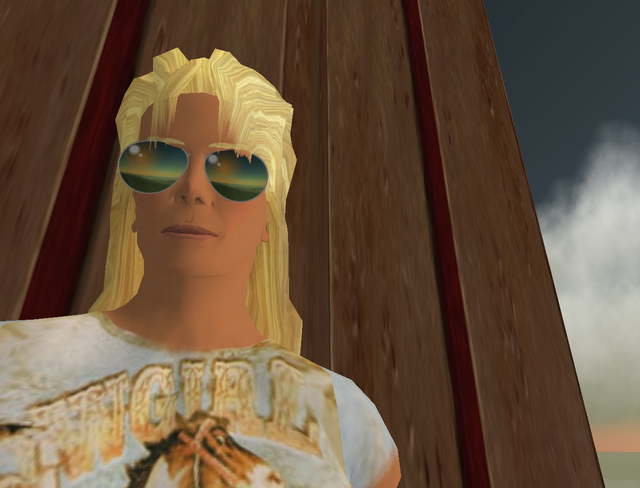 Mr. Neva still retains his in-world account, however, where he is an established landholder and businessman. Citing a policy of subscriber confidentiality, Linden Lab declined my request to explain the reasons behind the suspension from the Forums, the motives and fallout for which have been already speculated and argued over on numerous Resident-run SL blogs. Rather than rehash those here, or tread into the quagmire of pitting Neva’s perspective against Linden Lab and the other Residents he clashed with, leading up to his exile, I’ve decided to devote my coverage to Prokofy’s theory of the Feted Inner Core, and its relation to Second Life. For the record, Neva vehemently disdains being compared to Noam Chomsky. "I don't reject the analogy of myself as a dissident," he tells me, "but I think Chomsky in real life is far more left wing, rigid, and extreme in his views than I am in the equivalent Second Life context.” As it turns out, Prokofy (who describes himself as someone who lived and worked in the Soviet Union for some years an émigré from the former Soviet Union) has actually met Noam Chomsky in person, he says, at a left-leaning scholars conference on the East Coast. “In person, Chomsky seemed very quiet and geeky,” says Neva, “with kind of a geeky look of ‘uncool haircut’ and plain button down shirt and chinos. Not at all fiery in his in-person rhetorical style… he actually comes across as a bit mystical and religious with the stare off into the far distance, the pauses, etc.— it's a little creepy, he's definitely a persona.” But that didn’t prevent Prokofy from taking him on face to face, he tells me. “I expected him to put up more of a real feisty fight when I argued with him about the Soviet Union, but he was very mild and almost regressive. My memory of him was that he just sat there and didn't respond much as I talked about the horrors of the GULAG, listening to some inner angel choir.” He laughs at the recollection. Further, he sees the Chomsky/Neva comparison as my clever strategy to de-legitimize his dissent. In a recent New Yorker profile of Chomsky, a peer described him as “the devil’s accountant.” Meaning— depending on your point of view— a demon of conscience who keeps ruthless track of a nation’s sins, to damn it, or a deceitful, self-serving inquisitor who sees only sin and corruption, even in the most virtuous actions. With his derisive contempt of his opponents and his relentlessly inflammatory rhetoric,Chomsky represents the furthest extreme of intellectual dissent possible in a free society. As such, he also represents what is perhaps an inevitable challenge to the very concept of an open community and its ability to foster free speech, when that speech practically clamors for its dissolution. Others may perceive other parallels, but for now, I’ll leave it at those. If there’s any key difference between the two (and here I speak from some experience, having criticized Chomsky in past writing) it’s Prokofy Neva’s willingness to suggest tangible solutions to his pessimistic diagnosis. And to offer empirically verifiable predictions that might confirm or refute his analysis. (For example, whether Second Life's population begins to plateau at 40,000.) We’ll check back in a year to see if his prophecies are more Cassandra than crackpot. For now, for the historical record—and more key, stripped clean of the personal scorn which were consistently threaded through Neva's Forum version, and Residents’ replies to them— the theory that accompanied Prokofy Neva’s rancorous rise and fall from the Forums. The Feted Inner Core is the group of talented and innovative high-visibility content-creators, clothing designers, script-writers, architects, and other virtual-world creators encouraged, subsidized, and celebrated by the Lindens since the inception of Second Life. They are the established and recognized elites at the world’s center who provide most resident content and the informed engagement the Lindens require in their software design. Distinguished more by an attitude of sometimes arrogant superiority by virtue of their actual and perceived accomplishments in line with Linden Lab’s goals, the FIC are not all oldbies, and include some newbies. “Feting” can occur in a variety of manners, from private talks [with Linden Lab staff], in-world to IRC chats to tier-free 4096 [square meter land] accounts and a free sim or free programming help and endorsement of products and projects, to graduating older players to becoming Lindens. The FIC views themselves as the rightfully privileged gatekeepers to the Metaverse and as such are the natural opponent of anyone seeking a more democratic, open, and pluralistic Metaverse. Prokofy Neva on the "Tekkie-Wiki"
There are two schools of thought about how you promote genius. The elitist approach (ancient Sparta) says you select an elite group and groom the select for greatness and privilege through a rigid apprenticeship, weeding out "feebs and choads" as you go. The democratic approach (ancient Athens) says you create a class of forty, you use the Socratic method of education, and you hopefully create the conditions not only for one-two geniuses to appear, but for all to reach greater potential. Like any company with sophisticated, customized products, Linden Lab will seek out long-term, trusted customers for commentary and that's natural, and involve them in plan and design as part of a marketing technique (this is the 'prosumer' of Future Shock). But given the hothouse orchid quality of this small, intense, and relatively under-populated world, it is vital for fresh insights, new views, other types of minds, other types of skills to be brought to the world-creation effort. You cannot make a society only of elitist tekkies or artisans, in the Ayn Randian or science-fiction vein, and have a pluralistic, robust, accessible and open world— tekkies alone are one-dimensional. SL will stagnate and corrupt if only a certain few beta-testers are continually heeded and not the needs of a wide variety of people in the world are taken into account. If Linden Lab continues to fete only these few, many non-technical players who are attracted to mass-culture, entertainment and "softer" game development (social networking, contests/games, non-profit work, support groups, variegated businesses and services outside software development) will become frustrated and leave. Already the lack of entry-level income-generating opportunities and the steep learning curve for tools mastery frustrate many. People do not want to be relegated to becoming the passive and docile consumers of the technocrats; they want democratically-accessible tools for both content creation of a variety of levels of competence and non-technical content, i.e. games, socializing, house-holding, etc. To avoid this dead-end, I believe Linden Lab needs to enforce the Terms of Service equally on the forums and stop its reliance on the much-abused abuse-reporting system, currently owned and operated by the FIC, and permit as much free debate about the game as possible. LL should convene in-world focus groups, both randomly and across sectors, to expand beyond its "FIC sounding board" approach. Regular thematic meetings convened by Lindens and more attendance by Lindens at resident-organized discussions outside of FIC bastions like Thinkers would help them get in better touch with the range of different classes and groups of people in the world outside their original FIC partners. Lindens need to broaden their scope beyond their recurring endorsement of FIC products and steering of real life media to FIC. Linden Lab especially needs to work hard to protect landowner rights, fix the group tools that make land ownership too risky, encourage rather than punish varieties of events and content and simply get out of the "lab" mode and the "white coats" mode more and realize it's time to stop fooling around with the "experiment" and work to stabilize the world so that it can grow and replicate. In a year's time, in the worst case scenario, the Forums will be scrubbed clean of dissent, a tight-knit group of FIC types will hold all the key third-party cites for communications and game-related functions like sales and blogging, and will also control mainly gated- community private-island real estate and thus access even to LL servers; indeed this is already the case in key parts of SL. An unstable game/tool space with churning trials and brief memberships, with many players frustrated not only due to performance problems and high-tech hurdles too high to cross, will die because you will not have the basic civilizational substrate to make a civil society. The content-creators not only lose customers, they lose the kind of critical customers with the power of the purse to compel design changes that suit their needs rather than passively accepting the push-media of most free or even high-cost content. I think it will continue to add members but it will churn and not grow that much bigger than what it is now, maybe 40,000 tops, certainly not going toward a million. Try to understand the validity of my impressions. You are constantly pecking and clawing at them but listen to what my basis is. I have about five sims worth of land and hundreds of tenants. I listen to them and study them. I honestly don't have regrets Hamlet, I spoke my mind sincerely in the light of my own conscience. Why, do you think I should have regrets? I believe that the Feted Inner Core are a bastion of power that brooks no dissent, and that Linden Lab is overprotective of them, and that they unequally apply the Terms of Service and that I am a victim of selective prosecution and far from being a "forum troll" I am a legitimate polemicist. And you know in your heart this is the case, too, Hamlet. Yes, it is my firm belief that my actions are entirely properly and blameless. And yes, it is my firm belief that the blame for the controversy rests entirely with the Feted Inner Core and Linden Lab. Why, do you expect to hear something else from me, Linden? I'm sorry not to be repentant, Hamlet, but there it is, it's my sincere belief. I know that I have not done anything wrong. Am I supposed to work this like a Pravda column, where if I express "sincere regret" and "promise to make good to the Motherland and the Party" I get to come back on the Forums? [laughs] I have no illusions that you're going to do some kind of flattering portrait. Well he certainly nailed the forum part pretty well, as any day now they're going to be more than scrubbed clean; they're going to be wiped away. I was just reading the other day about political movements in MMORPGs. Like the gnome protests in World of Warcraft. Blizzard did the same thing that Lindon does. It made public protest illegal or impossible. Still, the possibility of polotics in a simulated world amaze me. The issues that Mr. Neva is addressing isn't part of real world polotics, it is polotics completely created by the game world. And it turns out that game worlds aren't democracies. here we are in 2008. I joined in late 2006, and quickly amassed 12, then 35, then 45 sims, along with being an architect, all without the help of LL. Prok names me to the FIC simply because of my success, though I do not belong to any insider groups. Some claim Lindens hate me, some claim I'm their best buddy. I find it all a joke, and now SL registrations have hit 17 million users, 17 times the mark Prok said was impossible without her liberal socialist influence upon things. The conclusion: Prok has been wrong about a LOT of things, but you'll never get her to admit it. SO here we sit in late 2011 with Prok still on-board and continuing to pour her particular brand of vitriol into the overwhelmed ears of anybody brainless enough to listen for more than a few seconds. The so-called "permanent" ban from the forums is no longer there. The university in SL with whom Neva was at constant war is gone as are many of her enemies. Yes, there is a feted inner core right enough. Prokofy Neva seems to be one of them since many have been banned from SL for far less obnoxious behavior than she herself is guilty of. Yet on she goes, month after month, year after year griefing pretty much anybody she damned well pleases with no fear of discipline from Linden Lab. It not that she's been wrong about many things as stated above. It's more that she's seldom been right about anything which has made her a much hated figure the web over. Neva is a revolutionary without a cause. A middle aged housewife heading towards elderly troll/nerd wannabe with a fascination for all things Iron Curtain who has always underperformed by quite a few hairs behind people she refers to as F.I.C. - both creatively and intellectually. This is quite apparent through her posts she dedicates to singling out individuals. Her strife is not so much motivated by justice and desire to better the world around her, it's motivated by the agony of a person who never got to find a place for herself she things she deserves because of her social ineptitude, unwillingness to offer kindness and frankly - her self-inflicted repulsive appearance. I think SL gave her a great opportunity to try one more time to become someone prominent without the necessity to overcome her social paranoia and having to be in physical proximity of other humans and when she realized that even in this setting she doesn't make the cut, she consciously decided to dedicate her malfunctioning brain-power to being a quasi intellectual cyber bully. A good regular dosage of vitamin P could possibly soothe her ailments.